My homemade Lemon Pound Cake with Lemon Cream Cheese Frosting is dense yet moist – and bursting with flavor! 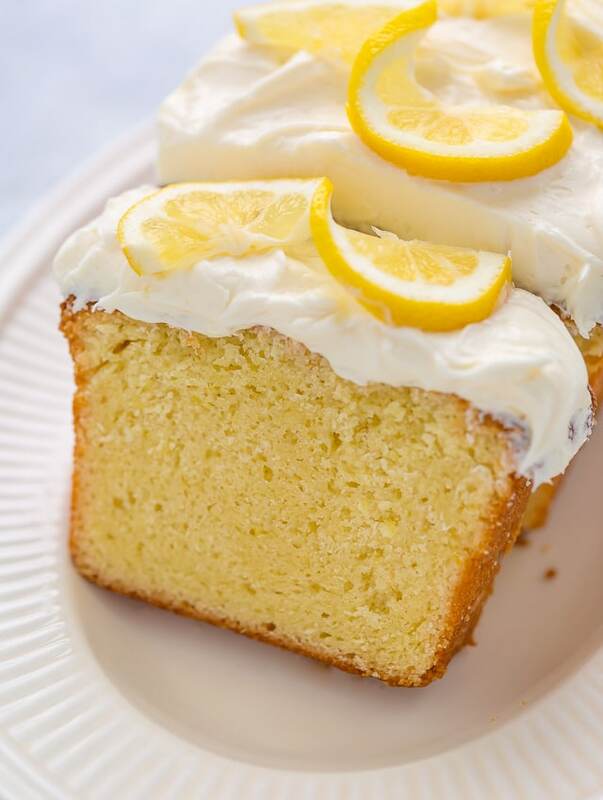 A reader recently asked me if she could easily turn my lemon cupcakes into a pound cake. Sadly, the answer was no. But lucky for us, that’s not the end of this story! Because I couldn’t get lemon pound cake out of my head! So I did what I do best: I tested and tweaked until finally: the perfect lemon pound cake with Lemon Cream Cheese Frosting was born! This luscious loaf is moist, sweet, and perfectly lemony. I absolutely love it with a cup of coffee in the morning! But if cake for breakfast isn’t your thing (??? ), it’s equally amazing for dessert! You could even top if with a scoop of ice cream. I have! Because we want a dense and moist crumb, cake flour is used in this recipe. You can find this ingredient in most grocery stores, or buy it online here. To achieve the best lemon flavor, you will use a combination of fresh lemon juice, lemon zest, and lemon extract. Because they all play different roles in developing the final flavor of the cake, I do not suggest skipping or substituting any of them. I find this pound cake is best eaten within two days of being made, but can be tightly wrapped and stored in the fridge for up to 3 days. I suggest bringing it to room temperature before serving it. We brought this to a picnic last weekend and it was a huge hit with our friends and family! 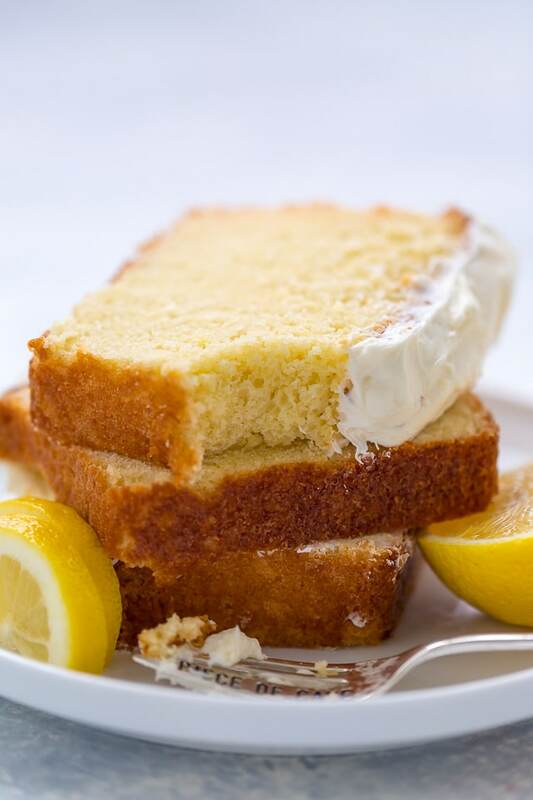 So if you’re a lemon lover and you’ve been searching for the perfect pound cake recipe, give this one a try SOON. 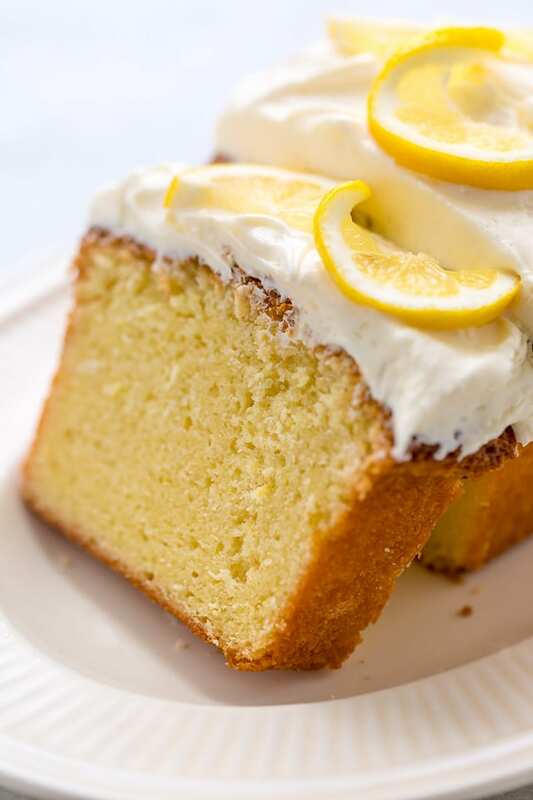 Dense yet moist, this Lemon Pound Cake with Lemon Cream Cheese Frosting is bursting with flavor! Adjust an oven rack to middle position, then preheat oven to 375 degrees (F). Spray a 9x5 inch loaf pan with non-stick baking spray; set aside. Melt the butter in a small saucepan over medium heat. Pour melted butter into a large bowl, then whisk in both sugars. Add in vanilla extract, lemon extract, lemon zest, and lemon juice and beat well. Add in the eggs and yolks, one at a time, beating well after each addition. In a separate medium-sized bowl combine the cake flour, salt, and baking powder. Add dry ingredients to wet ingredients and gently whisk together until just combined. Pour batter into prepared pan and smooth the top with a rubber spatula. Bake for 20 minutes, then reduce oven temperature to 325 degrees and continue baking for about 40 minutes, or until the top is golden brown and a cake tester inserted in the center comes out clean. Cool cake in the pan for 15 minutes before transferring it to a cooling rack to cool completely (about 1 hour). In the bowl of a stand-mixer fitted with the paddle attachment, or in a large bowl using an electric handheld mixer, beat the cream cheese, butter, and lemon extract on medium-high speed until completely smooth; about 2 minutes. Reduce the speed to low and gradually add the sifted confectioners' sugar. Once all of the sugar has been added beat on high-speed for 1-2 minutes. If the frosting appears too thin, add a little more confectioners' sugar, 1/4 cup at a time. 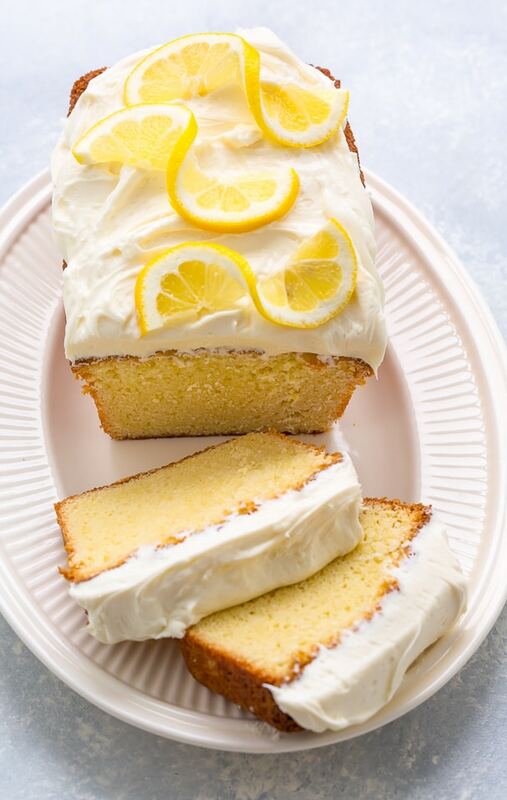 Once the cake has completely cooled, spread the frosting over the top of cake and decorate with lemon slices, if desired. Slice and serve! Store this cake in the fridge, covered, for up to 3 days. I’m a self confessed PIE ADDICT but this looks beyond amazing?! I love pound cake but I think the Lemon Cream Cheese frosting is what makes me weak at the knees! Wonderfully made! I love pound cake! This ones looks like it tastes fabulous! Looks so delicious! I cannot keep my mouth shut! Slurp! slurp! I am gonna make this myself! I am loving that you paired the cream cheese frosting with this recipe–so yum! The lemon pound cake by itself sounds amazing! But you took it up a notch with the cream cheese frosting! Yum! I wish I had this for my snack today! I am in love with this cake. 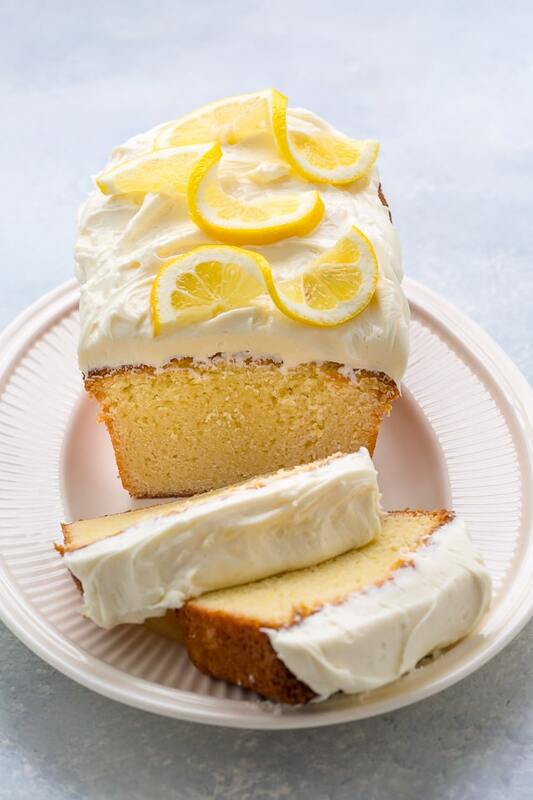 I love the combination of Lemon Pound Cake with Lemon Cream Cheese Frosting. This cake is really a star of any get together at least at my home.. I am going to make this. Its one hell delicious cake. Thank you for the recipe. Unfortunately, mine was on the dry side. I guess I overbaked it even though I didn’t even bake it as long as the recipe stated. The icing is delicious though.